QuickBooks is a line of business accounting software developed and marketed by Intuit. Small businesses use QuickBooks for most financially-related business processes, from entering sales receipts, tracking expenses, preparing and sending invoices, sales tax tracking and payment, preparation of basic financial statements and reports, and inventory management. For most tasks, QuickBooks doesn’t require users to understand standard accounting procedures, including double-entry bookkeeping. Most transactions are recorded using on-line screens that closely resemble paper based forms such as invoices or checks. To integrate your QuickBooks accounting data, such as sales figures, with an external application, such as a contact management or other business related application. Better decision making as a result of integrating financial data with a non-accounting application that runs your business. The information you need is at your fingertips, in real time. Does your company find the need to share information and data from QuickBooks to other applications? Wouldn’t it be great if your QuickBooks accounting software talked to your contact management software? Do you find yourself asking the question; is there a report that can show sales volume by referral source or can I forecast my anticipated revenue and labor hours for the next fiscal quarter? 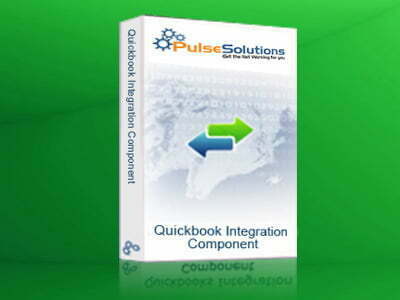 If you answered yes to these questions or have other similar questions, Pulse Solutions can help by integrating your QuickBooks accounting software with a custom application, thereby improving upon the way your company operates. Please call us or email us for a free consultation. Click here to post a quote request.